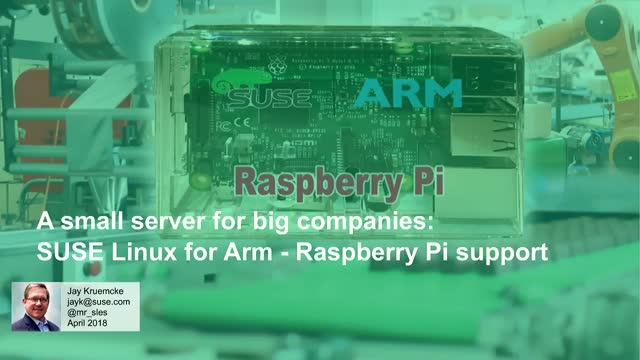 Announcing commercial support for the Raspberry Pi in SUSE Linux Enterprise Server for ARM. When we created a Raspberry Pi image for SUSECon in 2016 we got a tremendous amount of interest that resulted in thousands of downloads in just the first few days. Many people asked us “When are you going to offer real support for the Raspberry Pi?” The answer is Now! This webinar will detail what it means for SUSE to provide support for the Raspberry Pi, how some customers are already using SLES on the Raspberry Pi, and what hardware is supported.